There are few literary tropes more fascinating than that of the unreliable narrator. When one is led to doubt the honesty, perceptiveness, or even sanity of the person telling a tale, the story itself takes on very flexible and strange dimensions. The unreliable narrator forces the reader’s own imagination to engage in a sort of collaborative exploration of the text along with the author. Between the covers of a book, the narrator is God; he sets the agenda, he decides what aspects of reality are to be explored, and in what manner they will be perceived. But what if God is out of his mind? Or, worse yet, what if he isn’t? In the case of the novel Drood, by Dan Simmons, the God of perception is none other than Mr. Wilkie Collins. He begins the narrative fretting over the possibility that readers of the future will have forgotten him and his works. His fears are unfounded, as Collins’ reputation remains intact as a Victorian master of such works as the The Woman in White and his classic, The Moonstone, a novel which many now view as the precursor to the modern detective novel (Poe’s The Purloined Letter notwithstanding). However despite his success, in his own time his peers often derided Collins as a writer of “sensationalist” fiction (Victorian speak for anything that might frighten or turn one on). As a historical figure, Collins is the perfect ambassador from the Victorian era, bridging the gap between his time and the present with a mixture of caddish behavior, a stubborn disdain for both his own reputation and the social hypocrisies of his time, yet refined, proud and pompous enough to provide the reader a window into the mindset of a Dickensian era London society. It is the friendship between Wilkie Collins and the far more successful and famous ‘Inimitable’ (Charles Dickens) that focuses Drood. The narrative begins with Dickens recounting to Collins his involvement in the very real railway accident at Staplehurst that killed ten and injured forty in 1865. The real life Dickens was aboard the train when it de-railed, just as the real life Collins and Dickens were life long friends and collaborators. The accident was said to have a profound effect on the mental and nervous health of Charles Dickens, and may have been a contributing factor to the author’s death on June 9th, 1870, exactly five years to the date of the accident. But this is where any notion that Drood is a mere historical fiction ends, as the reader is taken on a gothic ride of madness, mesmerism, murder and opium fueled insanity. Dickens tells Wilkie of a mysterious figure named Drood who appeared to him at Staplehurst, a pale bald figure of nightmares worthy of Poe. His presence at the accident spurs Dickens to seek him out amongst the London slums and sewers known as “Undertown,” dragging the gout-ridden and laudanum-drunk Collins. What follows is a long and involved game of cat and mouse between Dickens, Drood, and Collins, who devolves slowly from modern minded skeptic to an increasingly unhinged obsessive. At no point in the novel can the reader really be sure if Collins is hallucinating, insane, or simply a character in an all too real ghost story. He is plagued with visions of a green skinned woman with tusks who repeatedly attacks him in his own home, as well as a doppelganger of himself who is slowly taking over his duties as a writer (and is in fact the better writer). He commits an act of atrocity in his own home that goes singularly unnoticed (did it actually happen, or was it an opium dream?). The spectra of Drood looms large over the life of Wilkie Collins in the five years following the Staplehurst disaster, and as Wilkie, in his own demented way, trains himself as a detective in order to solve the nature of the relationship between Drood and Dickens, the inspiration or the genre birthing The Moonstone takes form in his mind. As fascinating as this macabre tale is, it is overshadowed by the complex and often tragic nature of the relationship between Collins and Dickens. Wilkie both loves and hates Charles Dickens. He secretly looks down upon many of his most famous works whilst simultaneously craving his respect and approval. After the initial adventure into Undertown, Dickens takes a peripheral and sometimes aloof role in the ongoing madness. Like Collins, the reader is always a few steps behind whatever game Dickens is playing, and as the mystery deepens, the reliability of Collin’s perception and narration becomes more and more suspect as his mind and soul give way to the ever tightening grip of opium. As this roller coaster of craziness continues, the reader is treated to a wealth of insight and detail regarding Europe in the late 1860’s. The novel’s chief fault is that it is too laden with historical fact and ‘helpful’ detail. Simmons is obviously a demon for research, and cannot bear to part with the mountain of historical nuggets he no doubt unearthed while researching this novel. And while the pursuit of such facts and tidbits was surely a delightful exploration of history, the actual dispensation of said facts bogs down an otherwise compelling story, sometimes grinding the proceedings to an outright halt. I personally could have gone my whole life without learning the intricacies and logistics of the London transit system circa 1860. Simmons is like that brilliant professor in college who had an unfortunate habit of trailing off into a series of indulgent digressions. Ultimately the payoff is worth it, but there is going to be a certain amount of banging of one’s head on the desk along the way. There is also a maddening degree of repetitiveness. I assure you, after 800 pages the phrases “My dear Wilkie,” “Gad’s Hill Place” and “the Inimitable” will make one’s very eyes fall out in revolt. And yet it is a testament to the power of the narrative and fascinating mystery that despite these problems, the novel kept me engaged through 800 pages of historical minutiae, Victorian pomposity, and Industrial era gloom. 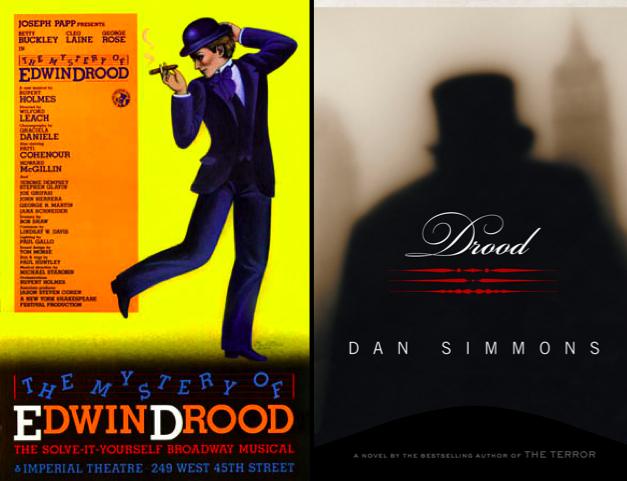 Dan Simmons is a master at many genres, and through Drood he has created an utterly fascinating, at times exhausting yet genuinely frightening and utterly tragic tale. It is a thoroughly unique reading experience, and well worth the time and effort of such a challenging and sometimes frustrating read. For me, the payoff was my “dear Wilkie”; Wilkie Collins is at times an arrogant, self-serving weasel a narrator, but he remains oddly likable and intensely fascinating throughout the book. Next George Will Hates E.T. Wilkie Collins doesn't need to worry about his rep/legacy. Sjp and m. Broderick have him covered: their sons middle name is wilkie in honor of their fav writer or at least the writer both admire the most. Also David Ben-merre wrote a review about dickens and doubles you should check out. Thanks JBM, any chance I could get the link of that review?